Gautama Buddha is really a special personality. Although many of his original teachings are lost, and the only records of his teaching was started to be written down only after 200 (some say 300 or 400) years of his passing. Thus historically, what we find as Buddha's teaching may not be his original, but inspired by other Buddhist of later times. But my point is not exactly that. My point is his method of preaching Dhamma (the teaching). As i mentioned in previous posts that (whom we call) Messengers or Prophets are basically great social reformers and social workers. People from Confucious to Muhammad, from Buddha to Rama Krisha are such great peoples. Peace and blessings of God be upon them. But among all the great teachers, Buddha is very special. This is because all the social reformers like Moses, Jesus used God as central theme for inspiring people to come back to a life of balance. But Buddha was born in a society, in such a special time when the idea of God was not helping out. People had a matured concept of the all pervading Brahma (God) in that Hindu Civilization. Remember, Buddha himself was born as hindu. There were ascetics practicing. But the society lost its harmony. People were suffering in all sense. Among that chaos, when Buddha gained his wisdom and insight into the causes of suffering (Dukkha), he right aways didn't bring God as central theme. He knew God idea was not helping bring harmony among people, and moreover people was fighting over my God and your God. That is why in his teaching we find little talk about God. As if he remained silent in that question. Rather he opens up another DOOR TO ETERNITY. 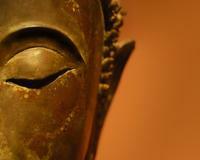 Buddha teaches the inner consciousness that is present inside all of us. We all have conscience, and if we are aware of our being, that conscience is enough to guide us. That is like a autopilot to lead a life of godness on earth. As said in the Final Testament, Quran that God has give the paths to all. Either man be grateful or he can live in denial. Buddha was working on that as well. Buddha taught people how to know oneself. How to empty our heart and mind. Since heart is the throne of God and God takes His place only when we empty our heart from material attachment, from worldly attachment. Thus without talking about God, he was preparing the place for godly consciousness. His concept of Sunnyata is thus really a great teaching. I admire Buddha because he was able to transform the society, the mindset of the people at that very time of crisis. To bring back people from blind materialist life to a life of calm and self-awareness is something really wonderful. That is why, to me Gautama Buddha is one of the best person and philosopher who walked on this humble earth ! !